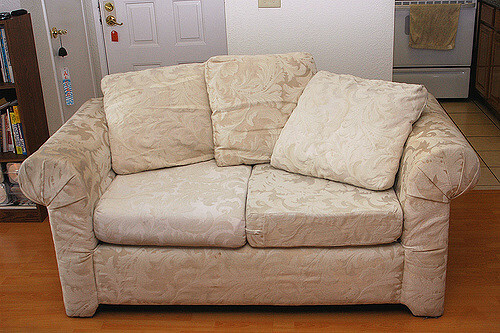 Love seat disposal or, really any type of furniture removal, is actually more difficult than most people think it is. This is due to a few different factors. First, is the fact that it’s used and there’s little demand for it. Second, is its size, which makes it difficult to move. And then, there’s the fact most of it is recyclable. Garage sale it. Use the opportunity to sell a bunch of other items at the same time. This is a great scenario because you’re pairing down on possessions, while putting a little money in your pocket. Price it to sell and do not turn down low offers. Place a local sales ad. Yet another alternative is to publish an online, local ad. Here again, price it very cheap so it goes fast. You can even pair it up with some other stuff, if you like. Donate it to charity. Of course, if it’s in really good condition, you can donate it to a local charity. Call around to nearby organizations to see if there’s any interest. Recover and reuse it. Another option is to simply recover the sofa and continue to use it. What’s great about this is you can customize it for a whole new look.Another option is to simply recover the sofa and continue to use it. What’s great about this is you can customize it for a whole new look. When you need any sort of furniture disposal, go ahead and phone 800-433-1094 or visit Junk Garbage Removal.